Congratulations to Paula Smith, ceramics instructor at Central Piedmont Community College. In January 2018, New Mexico-based artist Cannupa Hanska Luger created an instructional video requesting communities from across the U.S. and Canada create and send him 2” clay beads for a project he hoped to create to raise awareness of indigenous LGBTQ+ community members. Smith answered Luger’s call for submissions. 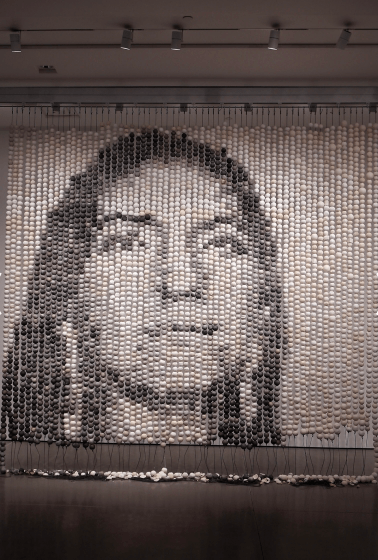 Soliciting the help of her peers at Moving Poets, Smith and the team created almost 200 beads for the project, which Luger used in his sculptural installation, “Every One,” now on exhibit in the Museum of Arts and Design in New York City. “Every One” is composed of more than 4,000 individual, handmade clay beads that were personally fired, stained in ink and strung together by Luger to create a pixelated image of the photograph “Sister” (2016) by First Nations photographer Kali Spitzer. The piece fits well into Luger’s portfolio of work which tends to address environmental matters and issues of violence against indigenous populations. It’s this passion for pushing the boundaries of his craft that earned him the Museum of Arts and Design’s 2018 Burke Prize. As a result, “Every One” and several other pieces by Luger are now on display in the Museum through March 17, 2019. Kudos to Smith for contributing to such a powerful work of art. To learn more about the piece and its significance, please visit cannupahanska.com/mmiwqtbeadproject. For more information on the college’s ceramics program, visit cpcc.edu/arts-interior-design/visual-arts/visual-arts-courses. This entry was posted in Arts and tagged award, ceramics, Paula Smith by Mallory Benz. Bookmark the permalink.